I’ve been working on a voodoo theme for this year’s Halloween with our decorations. 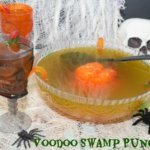 Then, I was at the Dollar Tree and saw the brain molds and just knew I needed to make a voodoo swamp punch with a giant frozen brain. 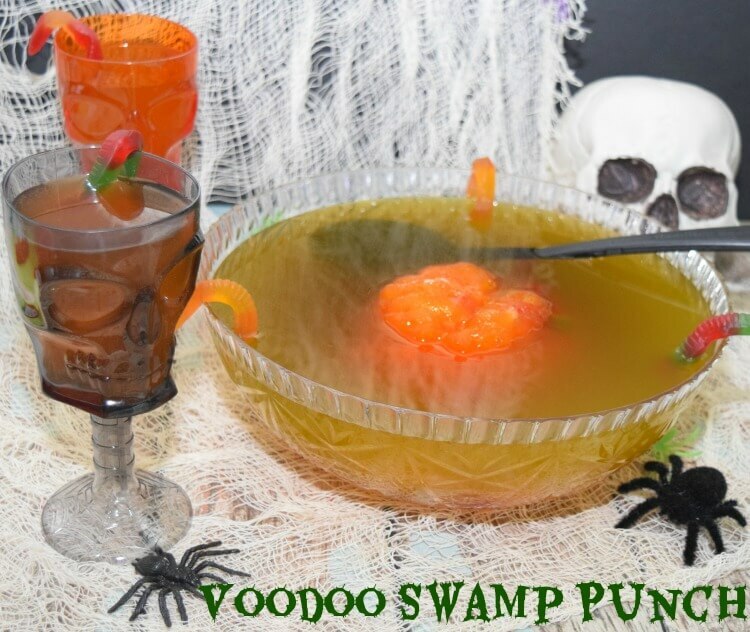 I decided orange and green Hawaiian Punch would turn a swampy brown for the perfect voodoo punch. I used the orange for the brain and the green for the punch. My brain needed to be riddled with gummy worms. 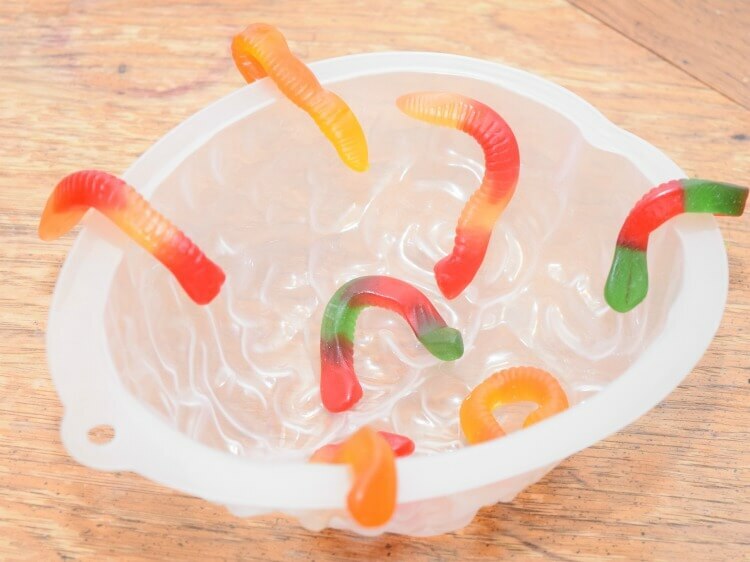 I first added gummy worms to the brain both hanging off the sides and inside. Then, I added the punch and froze it for a few hours. 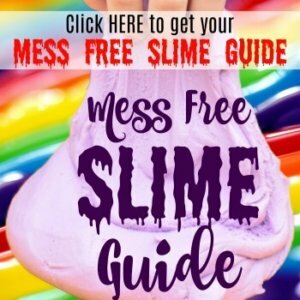 I totally recommend putting it on something flat so you don’t spill as you carry it to the freezer. When the brain is ready, slip it out of the mold and place it in a punch bowl. 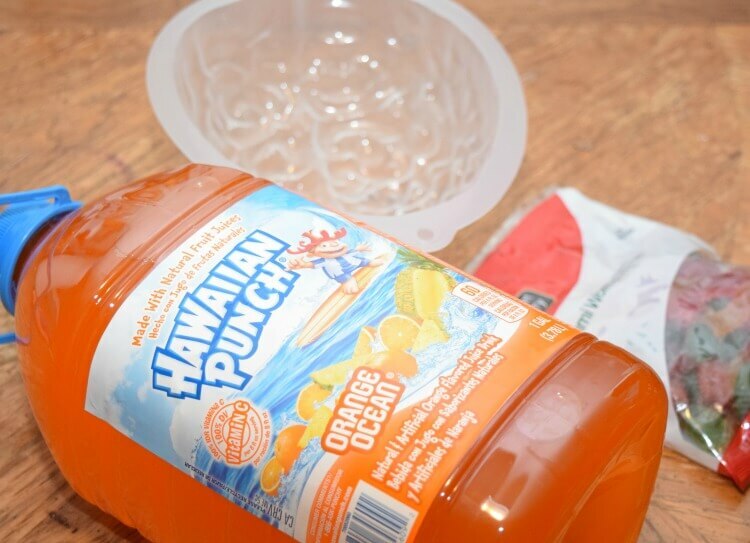 Combine green Hawaiian Punch and ginger ale until the brain is bowl is nearly full and the brain is floating. 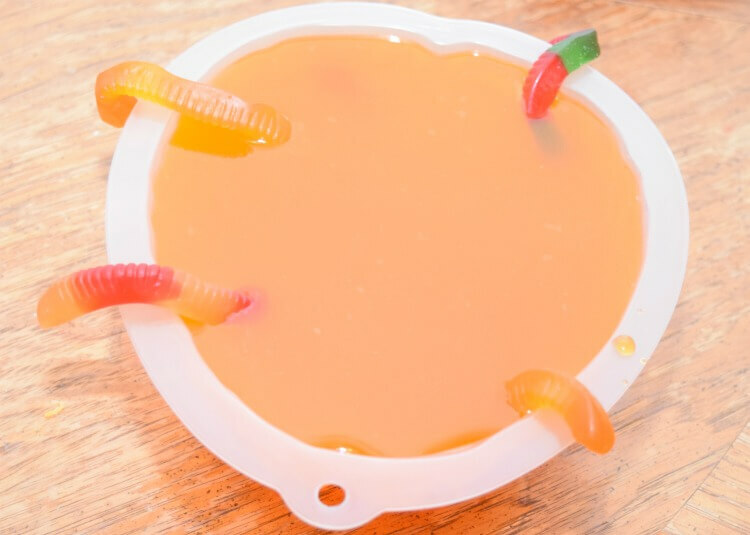 Add a few gummy worms to the punch. I found these skull glasses at the Dollar Tree as well. I garnished them with a gummy worm hanging off the side. The frozen brain will keep the punch cold for a long time. This is what ours looked like about an hour after it had been sitting in the punch. 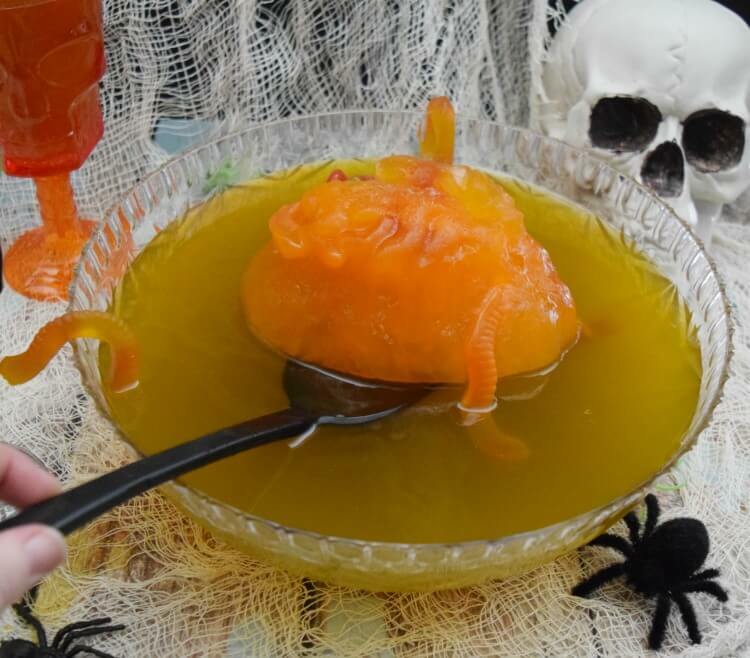 Add gummy worms to a brain mold and fill with the orange punch. Freeze the brain for several hours. Slip the frozen brain into a punch bowl and combine green Hawaiian punch and ginger ale. Brain should float once the punch bowl is filled. Garnish with more gummy worms. 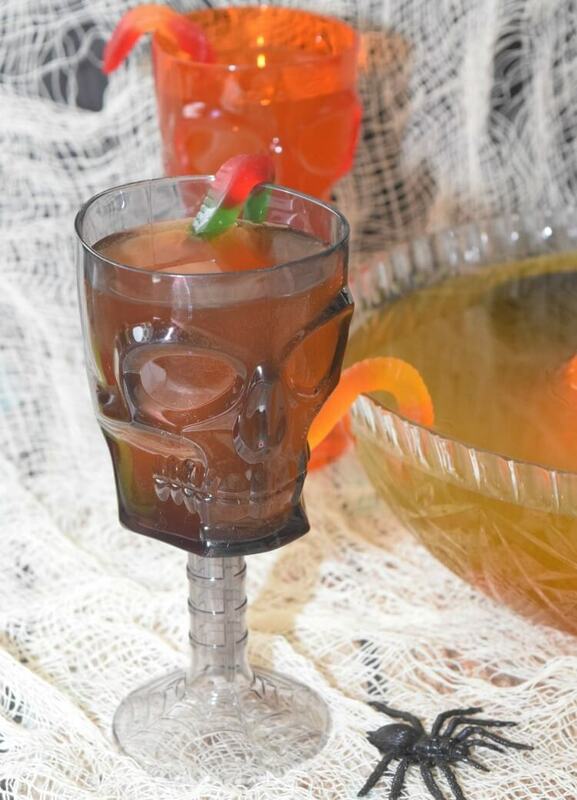 What’s your favorite party punch for your Halloween party?